YrlessPlus – A WISP profile by Ernie Newman. When you ask a business to introduce you to a happy customer to interview, you don’t usually get sent straight to the Mayor. But Gore-based WISP Yrless had me around to the Gore Council chambers, no less, within 5 minutes of reaching town and before I could even rustle up a flat white. Mayor Tracy Hicks – an imposing figure and considered speaker who would look equally at home in London or New York – is clearly a big Yrless supporter. He and his wife have been customers for years. Before Yrless, the big telcos gave them zero service and overstated their capability, he tells me. The couple switched to Yrless because it’s a local business with a great reputation and highly affordable. Mayor Tracy enthuses about the difference the WISP service offered by Yrless has made to his district. The connections are excellent, and the coverage has improved vastly – right at the time when broadband has become a necessity on Southland farms. The Council is in the midst of developing a strategy to reflect the diversification and increasing sophistication of its agricultural sector. Lifestyles, young families, and diversification are all making connectivity imperative. Schools need their students to be able to go onto the school Web sites and collaborate on line with peers from their homes, just as kids in the main cities do. That’s from the Mayor, no less! You can’t get a better endorsement. Back at base, Yrless founder and owner Joe Stringer is happily getting on with the day-to-day job of running a busy WISP. It’s the middle of the Southland winter so the solar panels are running low on some of his 78 rural sites, leaving a few generators struggling. So preventive maintenance is needed to make sure the customers get seamless services. Not a major problem, just part of the day to day job. Yrless dates back to 2005. Joe trained in IT in Invercargill, then came home to the farm where his family are prominent breeders of Angus cattle. His parents were early adopters of technology and were keen to digitise the stud records – these days they are sent to Feilding and incur a financial penalty if they are not sent electronically. Dial-up on the farm was never going to do the job. 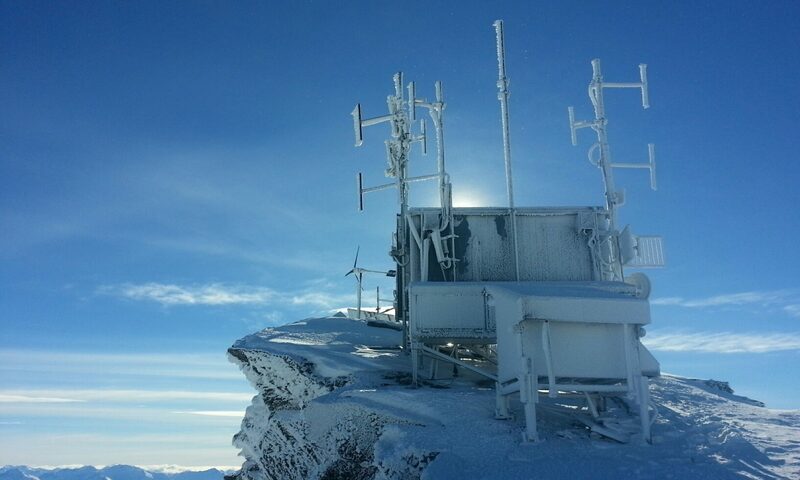 So Joe put up a radio tower so they could get acceptable Internet from Gore. For a while there were just ten customers. Then through his part time role as a volunteer firefighter Joe met business partner Norman McLeod. Joe is “almost” full time with Yrless. That is, when he’s not occupied on the stud farm, being a volunteer firefighter and trainer for the Gore and Waikaka brigades, paragliding, or learning to fly helicopters. No couch potato, this guy! Luckily there are several other staff – about 4 full timers and a similar number of part timers. Everyone works from home, walking the talk about modern age location-independent working enabled by great connectivity. It’s very successful professionally and personally, Joe says – but he concedes there are times when partners just want to get the staff out of the house for a while! The Yrless network is extensive. Coverage runs from Milton south of Dunedin, to Mataura south of Gore. Inland it goes to Roxburgh and Lumsden, and on the seaward side to the Catlins area. 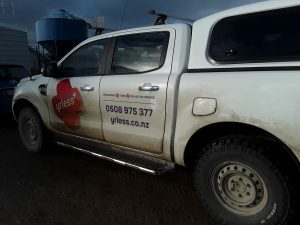 Other WISPA.NZ member WISPs intersect with Yrless at every boundary, giving a seamless service into Otago and other parts of Southland. Looking ahead, he has plans to move more into fibre optic. 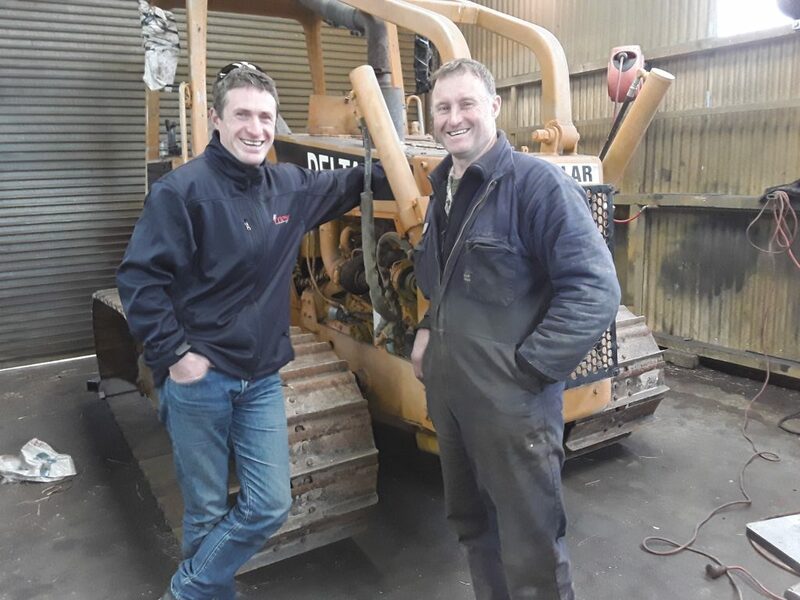 One large dairy farmer is investing substantially to lay fibre to a wintering shed and farm cottages, and Joe has commissioned a hydraulic ram to be attached to a bulldozer (pictured) to lay it. It’s a big investment but well worthwhile for the future. Joe Stringer in front of customer Mike Key from James Engineering with the bulldozer being modified to lay fibre. 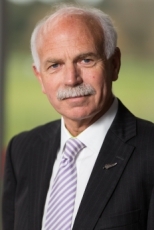 “We are lucky to have some very forward-thinking farmers in Southland,” Joe says. “High speed resilient Internet brings a lot of efficiencies as well as being a big factor in staff retention.” One example was a recent call from a real estate agent who wanted wireless Internet set up in an empty rural property to make it much more attractive to sell. 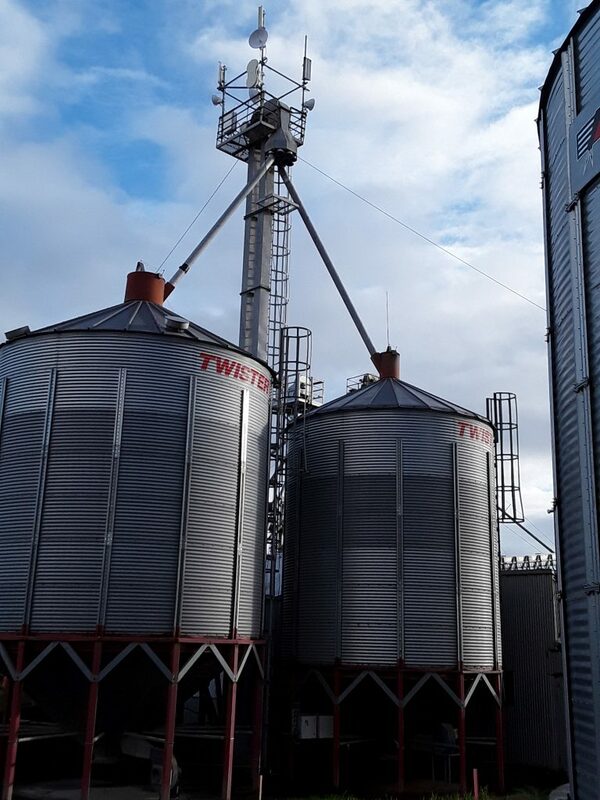 Many Yrless customers use their connectivity to support remote operation of highly sophisticated machinery such as grain driers and pellet makers, often controlled 24/7 by operators on the other side of the world. That is hugely efficient and makes reliability seriously important. Who needs a hill when you can put an antenna on top of a grain silo? The best thing about being a WISP? “Meeting people, helping with installs and sorting out other problems, and seeing places I otherwise wouldn’t,” Joe says. Yrless has big development plans. More fibre – “wireless to the site then fibre around the cluster,” moving into retailing electricity, big data storage, and offering a cellphone service are all on the radar. An “enabler for the district” with “vision and drive” as the Mayor says?